Use outdoor flower vases or flower pots to weigh down the legs of a canopy. 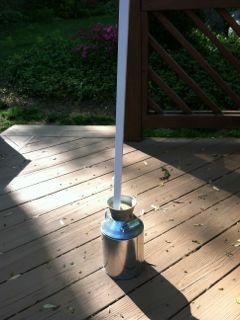 Put each leg of the canopy into a metal or plastic vase, fill it with sand and voila! Your pop-up tent is anchored to the deck. 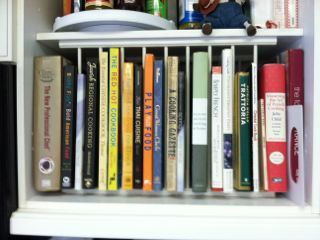 My mom's plates were too large to fit in this built-in plate rack, so instead she uses it to hold her frequently-used cook books. Don't know what to do with the containers that gifts come in? 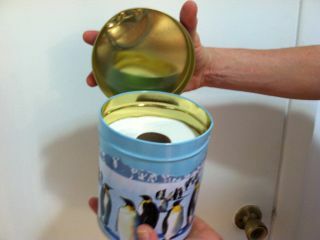 Here's a creative new use - a toilet paper holder! 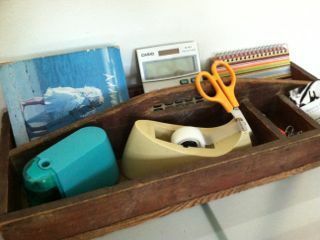 Repurpose an old tool tray to be a desktop organizer. No need for a tie rack that's already built in? Great! 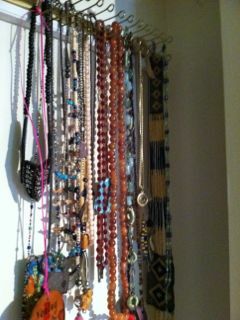 Use it as a necklace holder! Do It Yourself: A great use for old or no longer worn t-shirts is to make a scarf out of them. Take those "I don't want to give up my most favorite" t-shirts, cut out the important parts of each one into squares and sew them together. This way you get to keep your memories, save space in your closet and get a new, very unique scarf. Before tossing baby announcements, birthday cards, thank you notes, etc. in the recycling bin, turn them into one-of-a-kind gift tags. Tear off the front cover and cut into squares or any shape of your choice. Write your message on the back, punch a hole in it and attach it to a gift with ribbons. Save trees and money too! Don't know what to do with the mass of cards you receive on your birthday or for the holidays? Repurpose the following household items for a free and easy do-it-yourself solution. Put your cards on display by tacking up pieces of twine and/or saved ribbons on some empty wall space. (Get creative - use funky or decorative tacks to match the room's color scheme.) Utilize clothes pins or binder clips to hang the cards and voila!